Stacey’s Trio – Boneless chicken wings, calamari and hand-cut mozzarella sticks. I don’t know who Stacey is, but her trio is delicious. I’m an expert when it comes to fried cheese sticks, and these are massive and delicious. This sampler platter is served with three different dipping sauces, because one dipping sauce is definitely not enough. Philly Cheese Steak – I’ve been to Pat’s and Geno’s in Philadelphia, so I like to think I’m an expert when it comes to Philly Cheese Steaks, too. This version features shaved ribeye steak, American and Provolone cheese with sautéed peppers and onions on a baguette. Probably the best Philly in town. If you think you know of a better one, please let me know. I want to try it. Cajun Chicken Pasta – If I could only eat one kind of food for the rest of my life, pasta would be it. If I could only eat one single pasta entrée the rest of my life, this Cajun chicken pasta would be it, too. 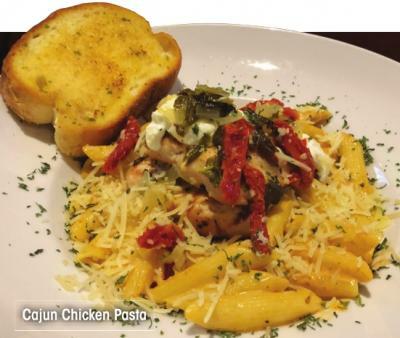 A grilled chicken breast topped with sun-dried tomatoes and Créole cream sauce over penne pasta with Parmesan cheese. 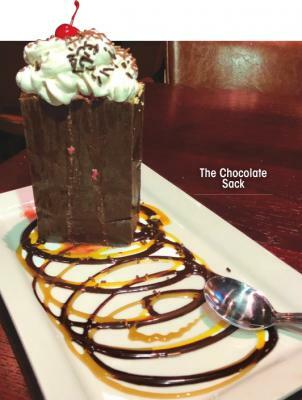 The Chocolate Sack – This menu item alone is what put this place on the map. It’s legendary. Literally a sack made of chocolate, filled with cake, ice cream, graham cracker crumbs, strawberry compote, toasted almonds, topped with whipped cream and drizzled with chocolate and caramel. Perfect for two people to share. Available on Saturdays and Sundays from 9 a.m. to 3 p.m., and the Bloody Marys and mimosas are $2. Two dollars! You can’t beat that. I’ll pair my mimosa with the chicken and waffles. And beignets. And the French toast. You’ll know where to find me on Saturday morning. Vibe: Upscale cozy with several different dining room options for seating. Great patio space for breakfast or an after-dinner nightcap. Friday 11 a.m. - 11 p.m. Saturday 9 a.m. - 11 p.m. Sunday 9 a.m. - 10 p.m. Monday – Thursday, 11 a.m. - 10 p.m.